Get picked up and dropped off at the airport with no hassle or drama. Much cheaper than a taxi ride too! Because most Las Vegas Strip hotels don't offer complimentary shuttle service to the airport, check these out! Las Vegas taxi cabs are infamous for taking you around on a detour to jack up the final fare for a cab ride. Sometimes they're even in cahoots with clubs or restaurants and will take you to a place you didn't even want to go! 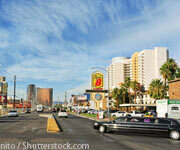 With these Vegas shuttle services, your transportation in Las Vegas is much more assured. If you are travelling alone or with just one person, shuttles are especially useful for getting around Las Vegas. Granted, if you have four or five people and you know you can defend your right to a fair ride, a cab might make better sense. Las Vegas Airport Round-trip Transfer: For less than $15 round trip, a friendly and knowledgeable driver will pick you up or drop you off at the Strip hotel of your choice. Downtown Las Vegas hotels will cost you a bit more, but are also worth the fee. Advanced reservation isn't even necessary! Just call when you get to the airport. AWG Ambassador: These cost $7 one way per person, or $13 round-trip per person. Find these guys at Door 11 outside baggage claim. Bell Trans: Similar rates as everyone else, Bell Trans also offers a fleet of limousines and other private cars if that's the transportation in Vegas you're looking for. Surprise, surprise! This 24/7 limousine service offers transportation to the Vegas airport for the same price as a taxi. For those of us who like to masquerade as rich important people, these limousine services are the way to go. When it's time to hit the club late at night, driving or walking is out the window for clear reasons. Drunk driving is a dumb idea anywhere, but especially among the crowded pedestrian-filled streets of Las Vegas. Meanwhile, all of the girls that make up your solid girl-to-guy ratio will not agree to walking even two casinos over due to their gargantuan stilettos and associated aching feet. The solution? Taking a limo, of course. When your group is able to fill out a Vegas limousine, this fancy method of transportation actually becomes more cost efficient than a cab in Las Vegas. Numerous companies and limo services operate in Las Vegas, including many who will even come up to your group when you're outside the hotel. However, it's imperative to do your research and book the cheapest limo service available. Scams are out there! If you have a smaller group but still want to travel in luxury, check out one of the private car services available in Vegas. Most of the large casino hotels offer private car services as a standard method of Las Vegas transportation. Getting around Las Vegas doesn't need to clean out your wallet, Cheapos! Casino Boy can help you get around Sin City quick and efficiently for less with the cheap Las Vegas transportation deals below. Whether you want the convenience of a shared-ride shuttle, or the luxury from a Vegas limousine or town car service, CheapoVegas has you covered when it comes to transportation in Las Vegas. 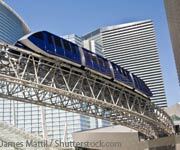 The compare table above is a great way to start planning Vegas transportation options. Transportation in Las Vegas can be a pain if you try to drive everywhere on the busy Strip. But cab fare adds up fast and spending all of your money on taxis is not what Vegas is about. The smart Vegas tourist will find a way to get around these problems with alternative transportation in Vegas. 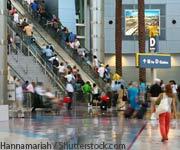 In many situations, Vegas transportation is a numbers game. If you have a large group of people moving in one pack, a limousine can actually be a smart Las Vegas transportation option. Make sure to check out Casino Boy'sVegas promo codes and featured Las Vegas transportation options for the best Vegas deals around. Whether it's traveling from the Strip to Downtown Vegas or getting a ride to and from the airport, there's a hassle-free way to travel around Vegas with a little help from Casino Boy.